Based on the phenomenal artwork found in the 3rd edition of Gray's Anatomy for Students, this set of 350 flashcards is the perfect review companion to help you test your anatomical knowledge for course exams or the USMLE Step 1! It's portable, it's concise, it's simply the best way to study anatomy. in a flash! Conveniently access all of the need-to-know anatomy information! Each card presents beautiful 4-color artwork or a radiologic image of a particular structure/area of the body, with numbered leader lines indicating anatomical structures; labels to the structures are listed by number on the reverse, in addition to relevant functions, clinical correlations, and more. Fully grasp the practical applications of anatomy with "In the Clinic" discussions on most cards, which relate structures to corresponding clinical disorders; a page reference to the companion textbook (Gray's Anatomy for Students, 3rd Edition) facilitates access to further information. Carry selected groups of flashcards wherever your studying takes you with the aid of pre-punched holes and a convenient binding ring. Access a clear, visual review of key concepts with wiring diagrams that detail the innervation of nerves to organs and other body parts, as well as muscle cards covering functions and attachments. Study efficiently while being confident in your mastery of the most important anatomical concepts! 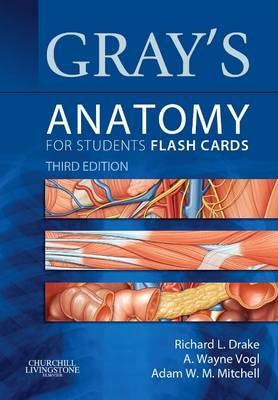 Flashcards have been thoroughly revised to reflect the updates made to the companion text, Gray's Anatomy for Students, 3rd Edition. Understand the clinical relevance of your anatomical knowledge with brand-new clinical imaging cards added to the set.